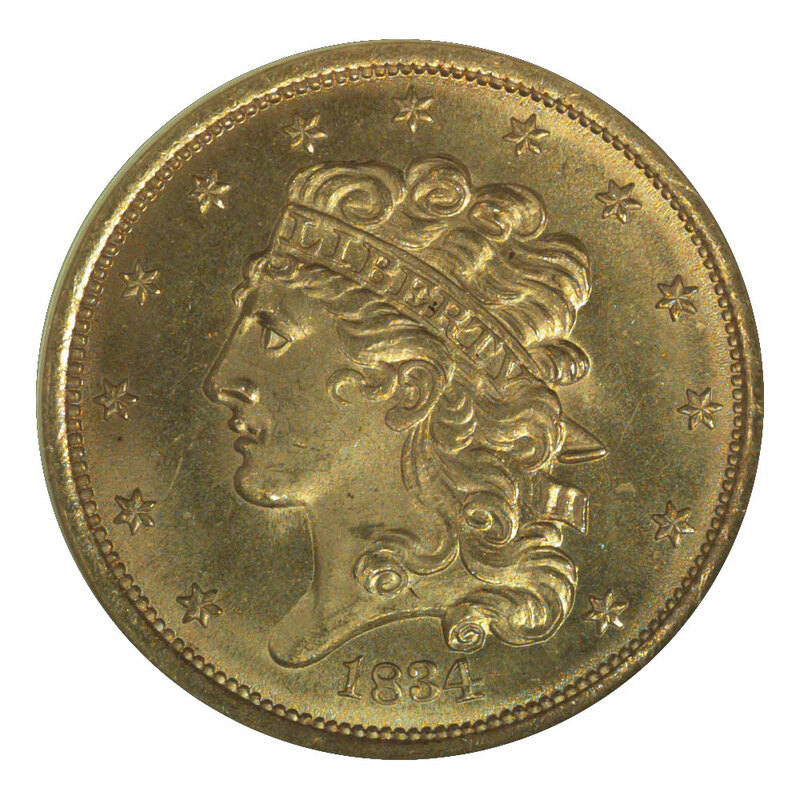 Until 1834 United States gold coins saw very limited circulation. Their metallic value was higher than their face value as reckoned against silver, and most pieces were simply exported as so much bullion. They were then deposited at various European mints, only to be melted and recoined. Belatedly addressing this problem, Congress finally passed a law in 1834 lowering the weight of United States gold coins. This law became effective August 1, and new designs were prepared so that the coins of the revised standard would not be mistaken for the older pieces and share their fate. U. S. Mint Chief Engraver William Kneass created new master dies for the quarter eagle and half eagle, the only gold coins then in production. 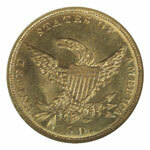 Known as the Classic Head type, five-dollar pieces of this design were produced from mid-1834 through 1838. The Philadelphia Mint struck these coins annually, while the Charlotte and Dahlonega Mints didn't commence production until 1838, the final year for this type. Though a short series to complete, most collectors choose to obtain only a single example for a type set or, perhaps, one from each of the three mints. The two branch mint issues are rare in the higher grades, and they're typically not well struck. For the type collector, the Philadelphia Mint pieces offer the best combination of quality and affordability. Among these the 1836 and 1837 issues are notoriously poorly struck at their centers. This same problem occurs with the 1834 and 1835 pieces, though to a lesser degree. The 1838 P-Mint half eagle is the best coin of its type in overall quality, though it is somewhat scarce in choice mint state condition. Actually, all coins of this short-lived type are scarce uncirculated, though there is a clear pattern of relative rarity. 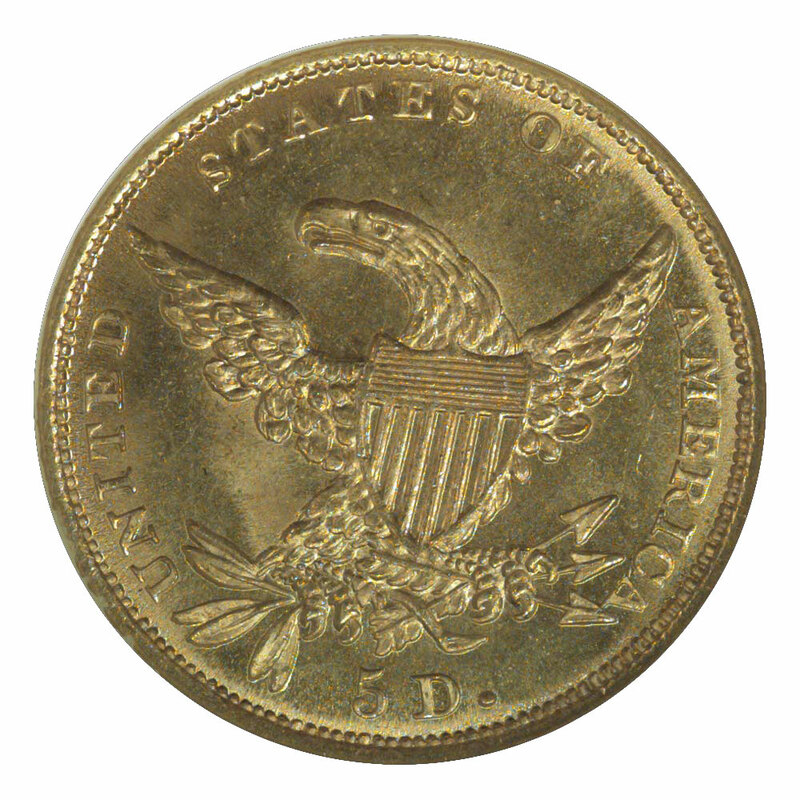 With its large mintage, the 1834 half eagle is the easiest to locate, followed in descending order by 1836, 1835, 1838 and 1837, the latter being very scarce. As made, coins of this type, though often poorly struck, were in other respects quite attractive. It is only through careless handling that they've been prevented from achieving higher grades. The decade of the 1830s preceded the widespread popularity of collecting coins, and no particular effort was made to preserve these issues. The mint state coins that have survived are typically marred by numerous nicks and scuffs, and their luster may have become impaired through improper cleaning. In fact, cleaning is an even greater problem with circulated coins, as these tended to acquire dirt and other debris that earlier generations of collectors sought to remove through rather clumsy means. A light cleaning usually won't prevent such coins from being certified by grading services, though harsh cleaning or polishing are typically causes for rejection. At their best, Classic Head half eagles will be highly lustrous and free of significant marks. Unless cleaned, these coins will usually exhibit light toning that reflects their alloy of mixed silver and copper. Ones having little silver tend to be a reddish gold, while those with a higher proportion of silver will be brassy in overall color, with an inclination to pale green toning. Of course, the reality is that most of these early gold coins have been either lightly cleaned or dipped in a mild acid solution to remove dirt and/or toning. Truly “original” examples are very rare.